The shape of the Star model - a big, elegant, black pen - recalls the simplicity of the traditional flat tops. This clean and simple form is contrasted with an incrustation inspired by the minimal beauty of the starry dark sky. which is the first pen made by Wiland. are decorated with 44 silver spots creating a pattern covering the whole pen. at the end of the barrel. The pen comes with a solid 14K gold nib signed Wiland. It is equipped with an ink converter. with a black paper etui, together with the Certificate of Authenticity. 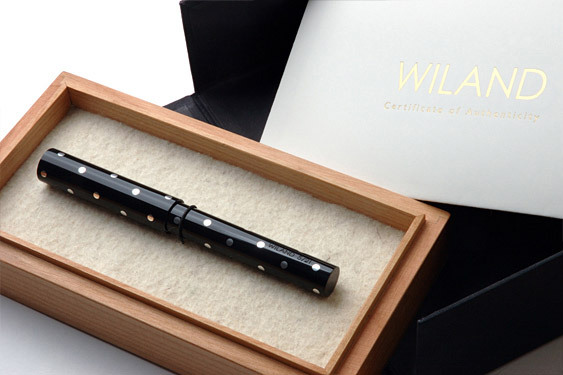 The Certificate of Authenticity includes informations about particular pen and Lifetime Warranty for the first owner.